Forgive the non-food post, but I know I have a lot of crafty readers and I just couldn’t resist sharing this with you. I know I’ve mentioned my desire to learn to sew many times in the past. I’m happy to report that I have been slowly learning some of the basics and am having a lot of fun with it. A great friend helped me get started and now I’ve jumped in on my own. The very first thing I made was this set of pillows for our new house and I absolutely love the way they turned out. They are very fast and easy to make with basic sewing skills and could make a nice gift, which is why I’m sharing them with you now! I’m not posting a full step-by-step tutorial because that isn’t the focus of this blog, but I thought I would give the basic steps I followed in case anyone might like to try making their own. First, I made my own pillow forms using a set of old white sheets I cut up and some stuffing I had left over from knitting projects. 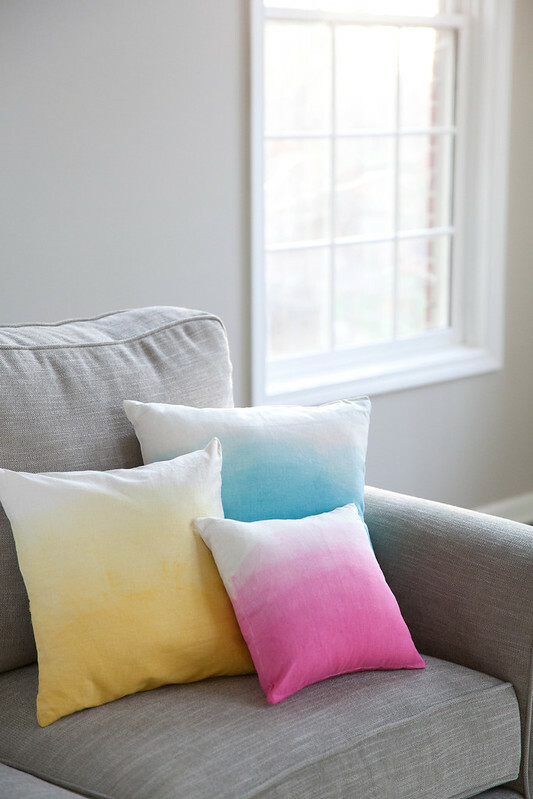 Pillow forms can be purchased at all sorts of craft and home decor stores, but I find them needlessly expensive so this was an easy and cheap alternative. I made the forms in three different sizes because the variation helps them look nicer as a set. I made envelope pillow covers in corresponding sizes using a natural linen fabric. (There are a gazillion tutorials for these out there. I used this one – nice and simple.) I love the way the texture of the linen looks when it is dyed. I prepared magenta, yellow, and aqua liquid Rit dyes. The bottle instructions make a much larger batch of dye than needed for such a small project, so I cut it down to about a third. Before dyeing them, I soaked the covers in water to help them absorb the dye more easily. To achieve the ombre effect, I dipped each cover into the dye about two thirds of the way up the fabric, then immediately pulled it a couple of inches out of the dye and let it hang over the edge of the bowl. I did this every couple of minutes to get the graduated saturation of the ombre effect. 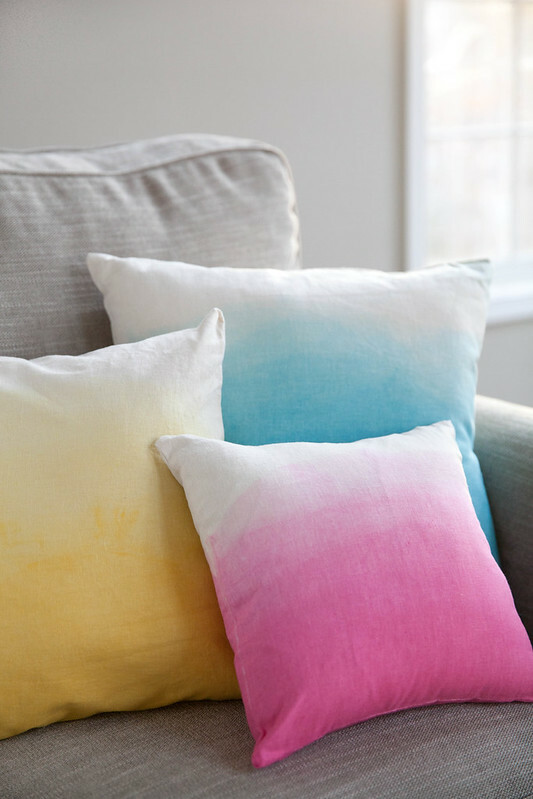 Overall, the whole dyeing process took about 10-15 minutes for each pillow. I rinsed the covers briefly to remove any excess dye, and let them air dry. Lastly, I ironed them and put them on the pillow forms. That’s it! I hope you enjoy this idea, whether for a last-minute gift or a way to brighten up your own home. I love the pop of color these give to our living room decor.